AWK is an interpreted programming language designed for text processing and report generation. It is typically used for data manipulation, such as searching for items within data, performing arithmetic operations, and restructuring raw data for generating reports in most Unix-like operating systems. Today, we will explore the AWK philosophy and different types of AWK that exist, starting from its original implementation in 1977 at AT&T’s Laboratories, Inc. We will also look at the various implementation areas of AWK in data science today. Using AWK programs, one can handle repetitive text-editing problems with very simple and short programs. It is a pattern-action language; it searches for patterns in a given input and, when a match is found, it performs the corresponding action. The pattern can be made of strings, regular expressions, comparison operations on numbers, fields, variables, and so on. It reads the input files and splits each input line of the file into fields automatically. AWK is a very powerful, elegant, and simple that every person dealing with text processing should be familiar with. This article is an excerpt from a book written by Shiwang Kalkhanda, titled Learning AWK Programming. This book will introduce you to AWK programming language and get you hands-on working with practical implementation of AWK. AWK: This is the original AWK interpreter available from AT&T Laboratories. However, it is not used much nowadays and hence it might not be well-maintained. Its limitation is that it splits a line into a maximum 99 fields. It was updated and replaced in the mid-1980s with an enhanced version called New AWK (NAWK). NAWK: This is AT&T’s latest development on the AWK interpreter. It is well-maintained by one of the original authors of AWK – Dr. Brian W. Kernighan. GAWK: This is the GNU project’s implementation of the AWK programming language. All GNU/ Linux distributions are shipped with GAWK by default and hence it is the most popular version of AWK. GAWK interpreter is fully compatible with AWK and NAWK. MAWK: Michael Brennan interpreter for AWK. TAWK: Thompson Automation interpreter/compiler/Microsoft Windows DLL for AWK. MKSAWK: Mortice Kern Systems interpreter/compiler/for AWK. AWKCC: An AWK translator to C (might not be well-maintained). AWKC++: Brian Kernighan’s AWK translator to C++ (experimental). It can be downloaded from: https://9p.io/cm/cs/who/bwk/awkc++.ps. AWK2C: An AWK translator to C. It uses GNU AWK libraries extensively. A2P: An AWK translator to Perl. It comes with Perl. AWKA: Yet another AWK translator to C (comes with the library), based on MAWK. It can be downloaded from: http://awka.sourceforge.net/download.html. Programs written in AWK are smaller than they would be in other higher-level languages for similar text processing operations. AWK programs are interpreted on a GNU/Linux Terminal and thus avoid the compiling, debugging phase of software development in other languages. This section describes how to set up the AWK environment on your GNU/Linux system, and we’ll also discuss the workflow of AWK. Then, we’ll look at different methods for executing AWK programs. Let’s take a look at each method in detail in the following sections. Now you have a working AWK/GAWK installation and we are ready to begin AWK programming, but before that, our next section describes the workflow of the AWK interpreter. If you are running on macOS X, AWK, and not GAWK, would be installed as a default on it. For GAWK installation on macOS X, please refer to MacPorts for GAWK. EXECUTE OPERATION: All AWK commands are applied sequentially on the input (records and fields). 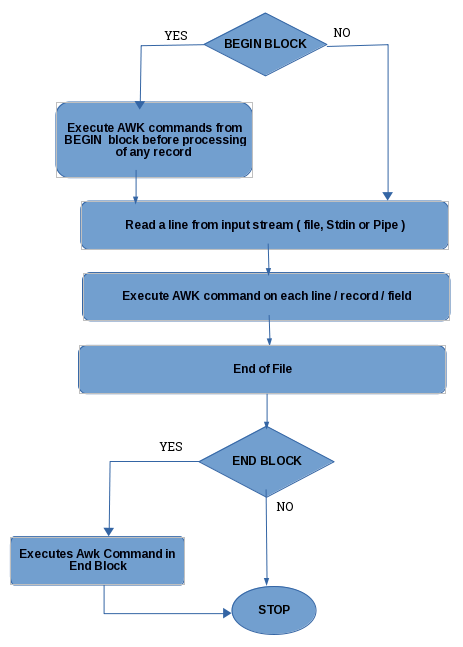 By default, AWK executes commands on each record/line. This behavior of AWK can be restricted by the use of patterns. 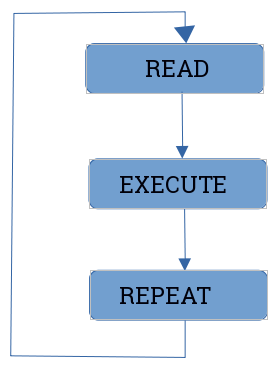 REPEAT OPERATION: The process of read and execute is repeated until the end of the file is reached. We introduced you to the AWK programming language and got ourselves a quick primer to get started with application development. If you found this post is useful, do check out the book Learning AWK Programming to learn more about the intricacies of AWK programming language for text processing.